Family man Darren Clarke says he will feel "uncomfortable" if he wins the BBC Sports Personality of the Year award. The Dungannon ace, who has put away his clubs for the year, does not want "the sympathy vote" for the December 10 award because of death of his wife Heather this year. The Irish star, 38, is the red-hot favourite to lift the trophy for his incredible role in Europe's Ryder Cup win at the K Club - just six weeks after his wife lost her long battle with cancer. But he said: "If people are voting for me because my wife passed away and they feel sorry for me, I don't feel comfortable with that. "If I'd won a major this year, then I'd have no issues with it whatsoever. "At the same time, if people do want to vote for me because it's 'Personality of the Year', that's fair enough, I can't really say no to that. "There is a part of me that it doesn't sit quite right with." Clarke has played just 19 events this year, including the Ryder Cup, and has withdrawn from next month's Target World Challenge in Los Angeles. The Ulster ace was set to be a major draw in the limited field invitational event run by pal Tiger Woods and has been replaced by Kiwi Michael Campbell. 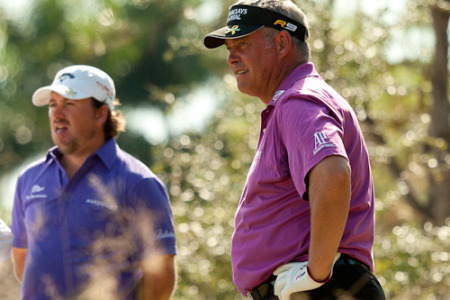 According to his manager Chubby Chandler, the hero of the 2006 "isn't ready to compete yet." Clarke wants to spend as much time as possible with his sons Tyrone and Conor, following the tragic loss of their mother on 13 August . And while his last act of the year could be to pick up the BBC award in Birmingham, Clarke believes super-middleweight boxing world champion Joe Calzaghe should get it for for his achievements in the ring. He said: "A large part of it doesn't feel right. It is not as if I beat Tiger down the stretch at the Open. "Part of me thinks it is very flattering that people would vote for me. I can't say no to that. But as I say, a large part of it doesn't feel right. "I'd be getting it for Heather and I don't want that. That's the sympathy vote. "I think Joe Calzaghe should get it because he is a world champion. He is a proper sportsman. "I don't want to stand up there and receive the trophy and burst into tears. That would be wrong." While Clarke has not had a great year on the golf course, dropping from 18th in the world at the start of the year to 33rd in the latest list, his Ryder Cup performance must rank as one of the outstanding of the season in any code. After grabbing two fourball wins with pal Lee Westwood, Clarke then completed a 100 percent record with a 3 and 2 win over Zach Johnson. European stalwart Colin Montgomerie revealed that Clarke was due to tee it up with Padraig Harrington in the afternoon foursomes on the opening day. But Monty explained that Clarke was so emotionally shattered by his morning effort that there was no way he could have teed it up again. Monty said: "You should have seen him in the locker room after winning his first match. "There was no way he was going back out there, that's why I took his place. "The emotion involved at the K Club affected us all, the American team included." Montgomerie described Clarke's feat of winning three matches out of three as "an achievement" considering what he had been through. But he does not believe that the Irishman should be given the BBC Sports Personality of the Year Award because of his personal torment. Montgomerie added: "It wouldn't be right if Darren won because of the tragedy he has suffered." Darren Clarke hopes that the most traumatic year of his life can make him a major force in golf. Darren Clarke last night rubbished claims that he wants to withdraw his name from the BB Sports Personality of the Year ballot. Darren Clarke looks certain to pull out the running for the BBC Sports Personality of the Year Award.